LockMeBaby is a helpful, free software only available for Mac, belonging to the category Utilities with subcategory Security & Encryption. Since we added this program to our catalog in 2006, it has obtained 30,742 downloads, and last week it achieved 4 downloads. 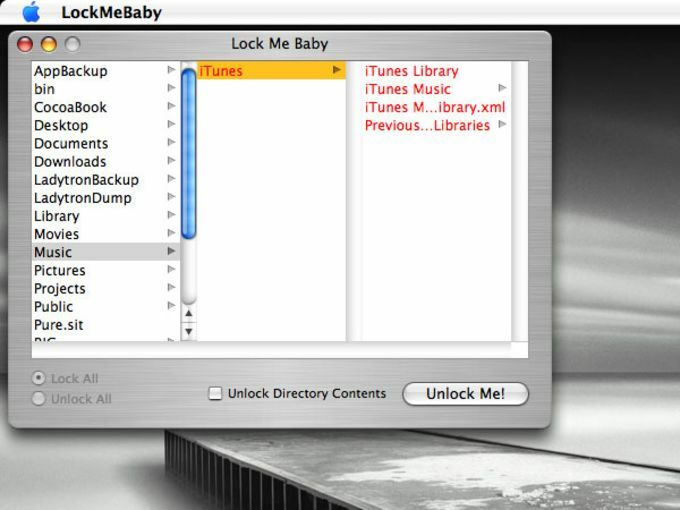 LockMeBaby is available for users with the operating system Mac OS X and previous versions, and it is available in different languages such as English and Japanese. The current version of the software is 1.1.2 and was updated on 3/11/2008. LockMeBaby is a pretty light program that will not require as much free space than most programs in the section Utilities. It's a very popular software in countries such as Ghana, United Arab Emirates, and Brazil. Instead of opening information window for each file you want to lock (or unlock), choose files and/or folders in LockMeBaby's file browser and just click "Lock Me" button. This simple application does no more or less than that, but I hope it might relieve you of the current tedious routine via information window. What do you think about LockMeBaby? Do you recommend it? Why?